By grrlscientist on January 21, 2009. The world in a jar: Is this the sort of world we wish to leave to our children? Dusky Seaside Sparrow (Ammodramus maritimus nigrescens). Image: Joel Sartore/National Geographic [larger view]. 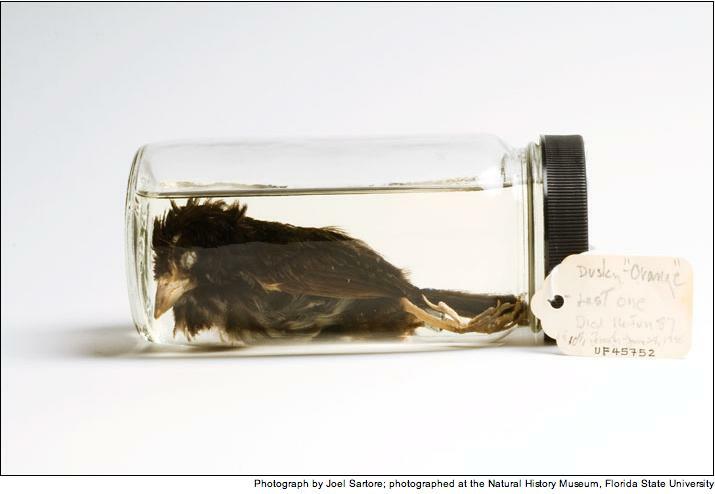 Slipping into extinction almost unnoticed, the Dusky Seaside Sparrow, Ammodramus maritimus nigrescens -- found mainly on Florida's Merritt Island -- declined from roughly 3,000 pairs to none as its salt marsh habitat was sprayed with DDT and taken over for use by the space program. The last Dusky Sparrow died in 1987. Photographer Joel Sartore has shared some of his work on this blog before, so I am thrilled to tell you that National Geographic also appreciates his exemplary work. You can view more endangered animals of the United States that were photographed by this talented photographer at National Geographic online. All images appear here by permission of National Geographic online. Orange Band and the dusky seaside sparrows are gone, but not forgotten. For more on the extinction on the Dusky Seaside Sparrow, read: A Shadow and a Song by Mark Jerome Walters. I'll second the recommendation to read "A Shadow and a Song." It's a sad and infuriating story. No wonder the thing's dead if we keep on putting them in glass jars. Is this photograph available to purchase? It is absolutely gorgeous and I would love to own it. In Australia, there has been a drought for six years that has made life difficult for wild budgies. I read details about breeding flocks that distressed me. If we don't watch out, parakeets will only live in our cages and the genetic makeup of the species will be limited to its hothouse varieties. I still remember the year that the last of its kind died. I read the article I found in the local newspaper to my middle school students that day. It's a sad time when a species is gone forever.